One of the easiest ways to cut dessert calories is to use fruit as a base for your treat. Fruit is a heck of a lot lighter than cream cheese. Sad but true! Strawberries are a win-win-win because they are beautiful, low in calories, and delicious. I find myself creating desserts with fresh strawberries a lot this time of year. They are fresh, plentiful, and much less expensive than in the winter months. Nothing beats fresh strawberries with a little bit of whipped cream for dessert but you can try one the recipes below if you want to get a wee bit fancier. My favorites are chocolate dipped strawberries and the stuffed strawberries. How do you serve strawberries this time of year? A four pound bag of frozen strawberries, 600 calories. Imagine how full we feel after a whole pound, only 150 calories. (We can get them year round, fresh or frozen. Our bodies appreciate the bulk: we feel full for hours). Knowing the calories of our 'go to' foods is vital. Our bodies burn calories, not 'points'. Keep it simple: only think about food when absolutely necessary. I work with people re: eating issues all the time. Programs with 'rules' that require focusing on food are unsuccessful long term. "Go to" meal: Fill a blender with frozen strawberries, add a little powdered milk, water, sweetener. It should fill the whole blender and be thick and yummy. Eat until full. Freeze what's left for later snack. Have it for breakfast, lunch or dinner. Keep huge bag of frozen strawberries: powdered milk never spoils. Rare trips to grocery store, where we are forced to think about food. Minimal thinking about food, minimal trips to grocery store, minimal time in kitchen, minimal calories, minimal cost. A WIN, WIN, WIN, WIN. 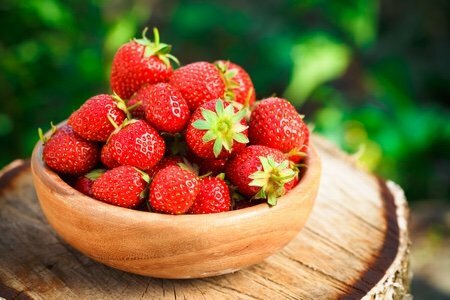 Delicious strawberries; eat many and often. In other words, strawberries are a dieter's best friend. I like to dip my strawberries in local chocolate pudding. YUM!! Strawberry shortcake is a classic this time of year - but I would certainly never turn away a chocolate covered strawberry!